Im all about that glow and making my cheekbones pop. I do love a good intense highlight but some days I do go for a subtle glow. The Makeup Revolution Ultra Pro Glow Palette is on another level. I was lucky enough to get this as part of a Christmas present from Dena Jayne. She knew I had wanted it for so long and I was so excited to try it out. 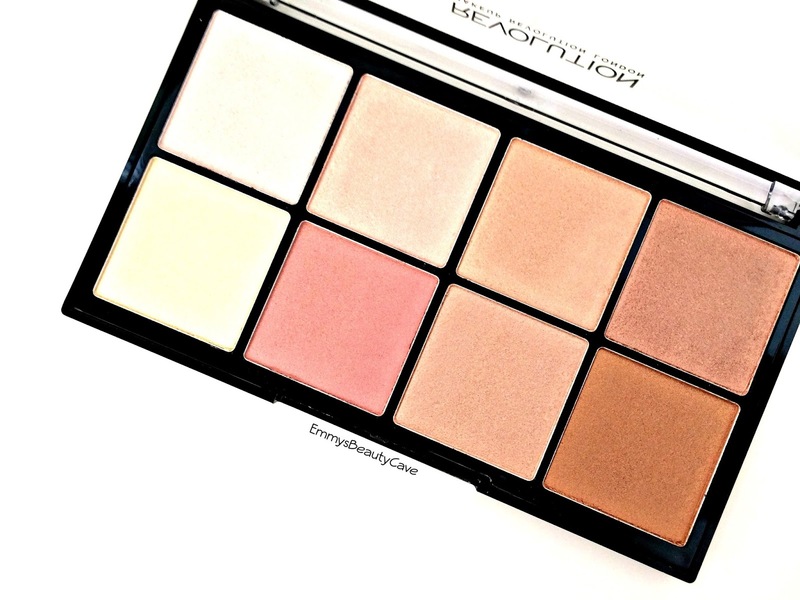 The palette consists of eight highlighters and they will suit all kinds of skin tones. I am quite pale and find I can use six of these as highlighters and the two darker shades I use as eyeshadows. It has a mixture of champagne, gold, pink, icey and bronze highlight shades. Some of the gold shades look dark in the pan but on my pale skin they work so well. 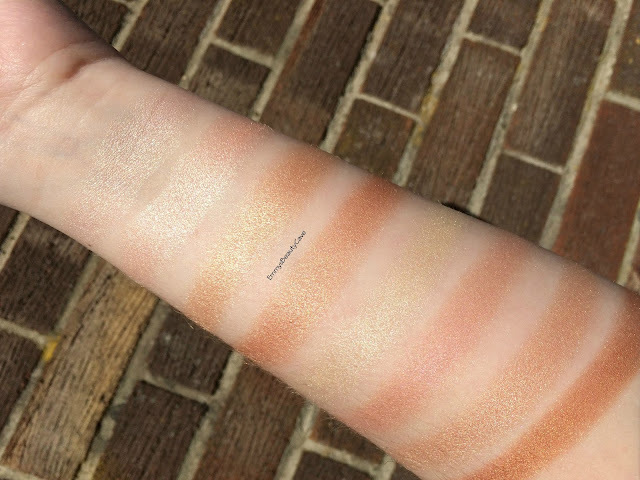 The swatched photo I took above has no editing at all, this shows just how intense the highlighters are in natural sun light outside. As you can see there is a wide range of pale champagne shades, pale gold, pinks, light bronzes and darker shades. The highlighters are so intense! When I first applied them I couldn't believe how intense they were. It is similar to the Anastasia Beverly Hill Glow Kits. I use this palette nearly everyday. I especially love mixing some of the shades together. I always apply them with the Real Techniques Setting Brush. 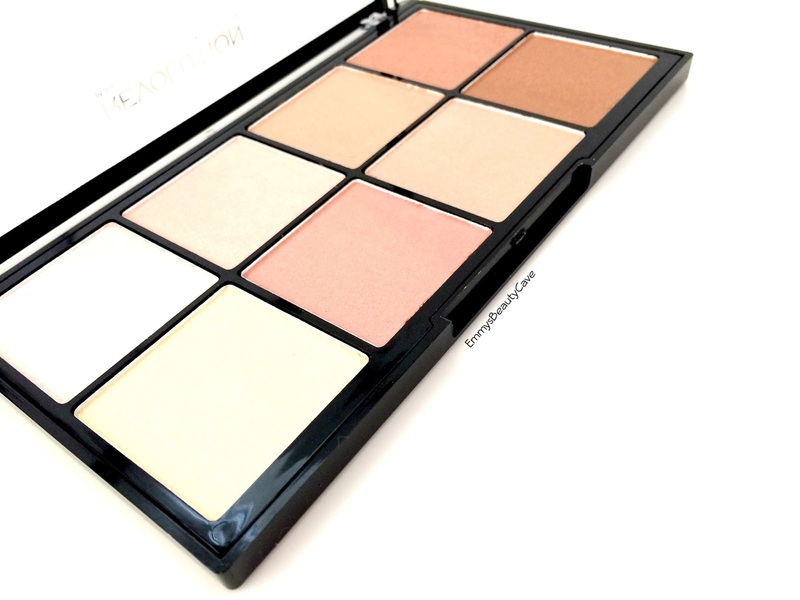 The Makeup Revolution Ultra Pro Glow Palette is only £10, an absolute bargain!